The panda is omnivorous. While bamboo represents 99% of their diet they have also been known to eat fish, pikas, rodents, vines, irises, crocus, mushrooms and rice grass. The panda assumes a sitting position to eat. Their unique forepaws have an enlarged wristbone that they can flex like a thumb. This allows them to direct bamboo stalks to their mouths where they strip off bites with their incisor teeth. Pandas digest about 20% of what they eat. (Cattle, for example, digest 60% of their intake) To compensate for their low quality diet pandas select only the most nutritious parts of the bamboo, they eat rapidly and they eat a lot. About 12 hours each day are spent feeding and they consume 12-15% of their body weight each day. During this time they consume between 23 and 36 pounds of bamboo shoots and leaves. They have been known to consume as much as 84 pounds of "new" bamboo shoots at one sitting. Special adaptations for digestion include large molars. 25 species of bamboo are eaten by pandas in the wild. Captive pandas will eat only 9 of these. 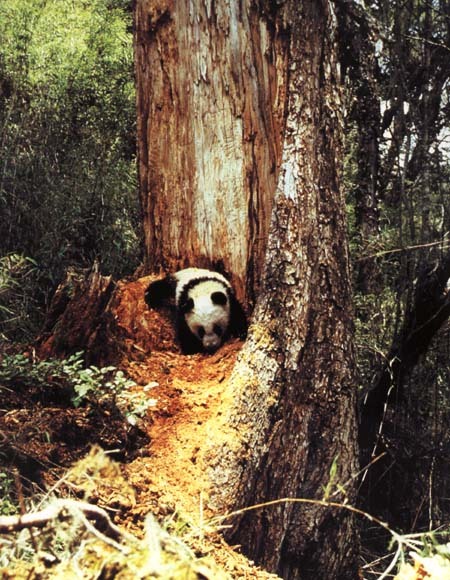 Only a few bamboo species are widespread at the high altitudes pandas now inhabit: Fargesia spathacea, Sinarundinaria chungii, Sinarundinaria nitida, and Sinarundinaria fangiana. Bamboo leaves contain the highest protein levels, stems have less. Because of the synchronous flowering, death and regeneration of all bamboo species, pandas must have a least 2 different species available in their range to avoid starvation. Throughout most of the year pandas have a water imbalance because their feces eliminate more water than the food brings in. They usually drink at least once each day.